During the colder months an excellent recipe to prepare in the oven is Italian baked chicken. This recipe consists of chicken coated with breadcrumbs and topped with marinara sauce, ricotta cheese, and mozzarella cheese. You can use your favorite brand of marinara sauce or even make your own if you want. This dish is very similar to chicken parmesan with the addition of ricotta cheese. The ingredients can easily be doubled if you want to make enough to serve 4 people. 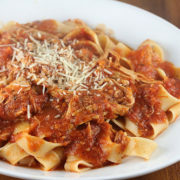 I like to serve this recipe with extra heated marinara and linguini noodles. Enjoy. Preheat the oven to 425 degrees F. On a deep plate or pie dish combine breadcrumbs, parmesan cheese, Italian seasoning, garlic powder, and salt and pepper to taste. Line a baking sheet with aluminum foil. Lightly grease the baking sheet with cooking spray. In a medium bowl add the beaten egg. Dip the chicken first into the egg and then coat with the breadcrumbs until evenly coated. Pat in any excess breadcrumbs. Place chicken breasts onto the baking sheet. Remove from the oven and spread a layer of ricotta cheese over the chicken breasts. Spread a layer of marinara sauce over the cheese and ½ tablespoon of fresh basil over the marinara sauce. Top with a layer of mozzarella cheese. Place back into the oven and broil at 450 degrees F. for 5 minutes or until the cheese has melted. Top with additional basil and parmesan cheese if desired. We made this TWICE this week. My daughter loved it so much she requested it the second night!! I just finished the leftovers (I have to double the recipe for our family). Thank you for sharing this. It’s SO good!